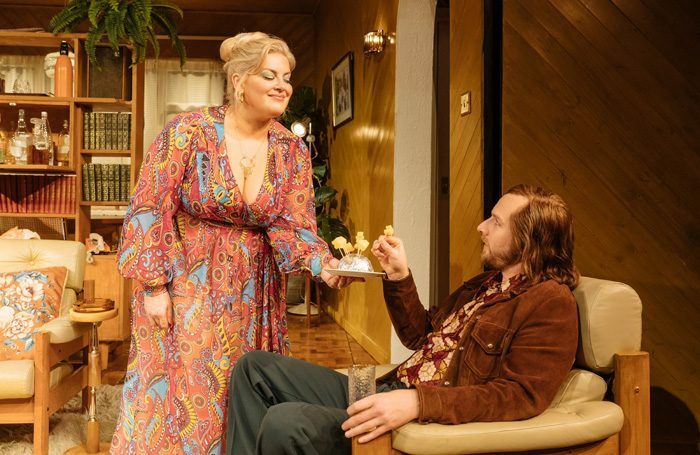 Abigail’s Party is a play very firmly set in the 1970’s with cheese and pineapple on cocktail sticks served up, talk of house prices being £21,000 and numerous references to the musical choices of the day it is very much of it’s era. The play unfolds in Beverly and Laurence’s living room as new neighbours Angela and Tony along with Sue come over for a few drinks whilst Sue’s daughter Abigal is throwing a party a few doors up. I had never seen Abigail’s Party before and being a keen theatre lover and having heard so much about it I felt that it was one that I should tick off the list. Unfortunately however the show itself didn’t sit well with me. Whilst I appreciate a lot of the comedy is from the era it was written I found that some of the lines were being played for laughs that weren’t funny. For example Tony repeatedly and aggressively shouts at his wife Angela. She later confides to Beverly and Sue that this frequently happens at home, although he isn’t violent. Instead of Tony’s outbursts being given the gravitas it needed it was played for laughs. There are many more moments which are just allowed to slip by rather than drawing on the emotion that could be within the piece in order to focus on the laughs. It was moments like this that left me feeling uneasy rather than sitting back to enjoy the play. In a similar vein many of the characters were larger than life, glossing over any intricacies that could be portrayed. Jodie Prenger as Beverly was gloriously grating and fun to watch however once again no space was given to allow the character any depth although this is a fault with the script itself rather than Prenger’s performance. There were similar issues with the rest of the cast. They all played their particular roles well. Vicky Binns played the put upon Angela and Calum Callaghan as the aggressive Tony but this dynamic wasn’t really explored in any detail although Angela was the one character I did develop some empathy for as her husband slow danced with Beverley whilst she sat trying not to watch. One of my favourite things about the show is the detailled 1970’s set designed by Janet Bird. The set is done up in a modern 1970’s living room with everything from a fibre optic lamp and the drinks cabinet just screaming 1970’s at the audience. The set however was slightly lost on the large Orchard stage. Abigail’s Party is billed as a ‘ground-breaking comedy classic’ however there is little left about Abigail’s Party that I found ground-breaking and certainty the comedy was played at the expense of over simplified sterotypes and some uncomfortable relationship dynamics. 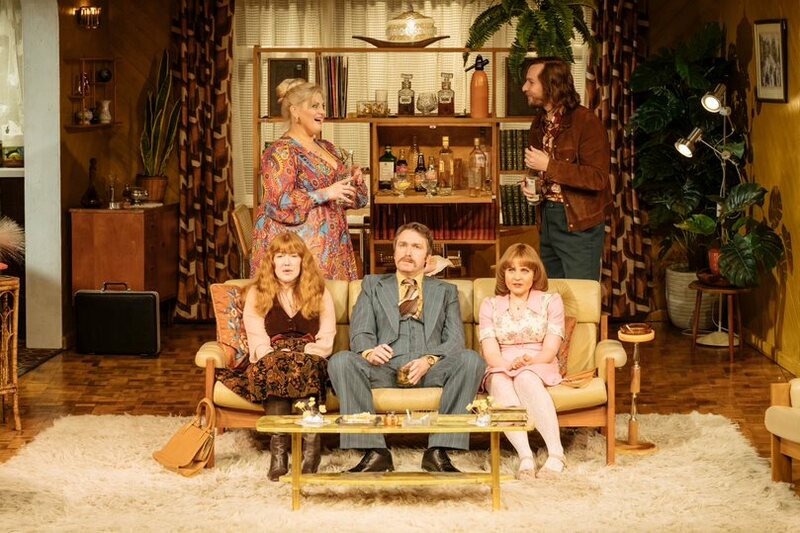 Abigail’s Party is playing at the Orchard Theatre until 6th April. For more information and to see where else the tour is going to, visit their website. If you like this review you might also like my review of Margaret Thatcher Queen of Soho, Calendar Girls and Come From Away.